Gotham Steel Pans feature advanced cooking technology, including an air-smooth non-stick cooking surface and super strong titanium, to make cooking easy. Endorsed by Chef Daniel Green, Gotham Steel Pans make cooking easy by combining a non-stick ceramic surface with super strong titanium. How? By allowing your food—whether it’s eggs, steaks, or even cheese—to slide right off, without using butter or oil. You also won’t have to worry about scratching your Gotham Steel Pans, since they’re safe to use with metal cookware. Need a way to make one-pan recipes? Gotham Steel Pans can help there too, since they’re oven-safe up to 500 degrees, and are PTFE/PFOA/PFOS-free. And when you’re finished, pop your pans in the dishwasher for easy cleanup! What’s So Special About Gotham Steel Pans? First, even if you’re a newbie to the world of cooking, you already know that non-stick pans are not a recent invention, and that you’ll find a wide selection at just about any home goods store near you. And despite how “revolutionary” it might seem, you’ll find dozens of non-stick cookware that also uses titanium. Sure, these might not always be as inexpensive as Gotham Steel Pans, but they might also be better quality. Pro tip: These types of pans are not made completely using titanium, which would cause them to be prohibitively expensive. Instead, as the product’s name implies, these are aluminum pans infused with titanium, with a stainless steel handle. If you did this, at the very least, you’ll be able to see and hold your pan before purchasing. And if you’re dissatisfied, purchasing locally will make the return process easier, while saving you some money in non-refundable S&H charges. Want even more options? Try typing “titanium non-stick pans” into your favorite search engine. You’ll quickly find that you have literally thousands of choices. 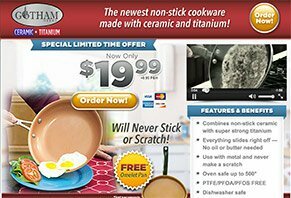 Even if you were to stay within the “As Seen on TV” industry, you’ve got options like the Slip Stone Pan, CorVex Cookware, QTech Cookware, Orgreenic Under 30, and many others. So, what makes Gotham Steel Pans different from these other options? Outside of price, there doesn’t something to be anything that’s meaningfully different. Speaking of price, how much do Gotham Steel Pans cost? How Much Does Gotham Steel Pans Set Cost? One 9" Gotham Steel Pan is priced at $19.99 plus $6.95 S&H. At checkout, you’ll also be able to purchase an omelet pan for an additional $6.95 S&H. Gotham Steel Pans come with a 90-day refund policy, less S&H. Did you choose the free omelet pan? This means you could lose as much in S&H as you’ll receive in a refund should you decide to process a return. Regardless, you’ll need to contact the manufacturer’s customer service department at 888-326-0978 to request one. Speaking of the manufacturer, who makes Gotham Steel Pans? There wasn’t any information about the company on the Gotham Steel Pans website, although based on the customer service phone number, it’s the same company as Optic 1050 Binoculars. These seem to have a mixed online customer reputation (primarily related to poor quality), so it’s certainly something to keep in mind. Most non-stick cookware uses a thin Teflon coating on the cooking surface, the trade name for polytetrafluoroethylene, or PTFE. More recently, due to potential health concerns, PTFE is often replaced with another type of fluoropolymer. Whichever substance is used (although Gotham Steel Pans are also claimed to be PFOA and PFOS-free), non-stick coatings work their magic by preventing your food and the pan from bonding at a molecular level, which they normally would under such high-heat conditions. Speaking of high heat, what kind of burners can non-stick cookware like Gotham Steel Pans be used on? Let’s take a quick look. While you’ll always want to check with your stove’s manufacturer about the types of cookware that can be used with it, titanium non-stick cookware is generally thought to be acceptable for ceramic and gas burners. On the other hand, DoItYourself.com recommends avoiding using titanium cookware on electric stoves, since it “conducts heat too quickly and can cause the thermostat in the burner to shut down too early or damage it.” Again though, this might be manufacturer-specific, so when it doubt, check your user manual. Finally, using titanium cookware like Gotham Steel Pans on an induction cooktop might be a bit of a crapshoot. Why? Because, in order for a pan to be effective on an induction cooktop, the bottom must be made of a ferrous (i.e. magnetic and consisting of iron) material. And unfortunately, titanium is a non-ferrous metal; unless Gotham’s manufacturer has included iron in the bottom and not advertised this fact. Ferrous or not, a lot of people are worried about chemicals contained in non-stick surfaces. With this in mind, how easy is it to damage Gotham Steel Pans’ non-stick coating? Is Gotham Steel Pans’ Non-Stick Coating Indestructible? When Chef Daniel Green started whisking eggs with an electric mixer inside his Gotham Steel Pans, you might have cringed. You’re never supposed to do that to non-stick pans, right? Right! If you want your non-stick pans to last as long as possible, you should avoid touching the surface with sharp or abrasive objects, like metal utensils or cookware (spatulas, etc. ), as well as steel wool. Will you be able to tell a difference after doing it just one time (like Chef Green)? Probably not. But it’s certainly not something you’d want to do on a regular basis, despite how the Gotham Steel Pans commercial might have made it seem. Pro tip: Most professionals also recommend that you avoid putting non-stick cookware in the dishwasher, despite what’s claimed in the Gotham Steel Pans commercial. Who is Chef Daniel Green, anyway? Perhaps best known for being a judge on Food Network’s Kitchen Inferno and for his full-time presenter position on EVINE (and part-time on ShopHQ, where he presents luxury cookware), Chef Daniel Green is an internationally known personality, as well as best selling author. Daniel has also created in-room dining menus for different hotel chains all over the world, hosted webisodes for United Health Care, and even created meals for BMI International Airlines. Our Bottom Line: Will Gotham Steel Pans Make Cooking Easy? If you’re going from a traditional pan to a non-stick one like Gotham Steel Pan, will it make cooking easier? Probably so. Does this mean you’ll instantly be whipping up healthy, delicious, chef-inspired meals? Unless you have years of experience (in which case you’d already owned a professional non-stick pan), almost certainly not. Regardless of your cooking experience, the key here is that there doesn’t appear to be anything special about Gotham Steel Pans that you wouldn’t also find priced similarly elsewhere online (or even less), or at a retailer near you. And despite its name, it appears the only steel contained in the pan is its handle. And considering that you’ll be losing a decent chunk of change in non-refundable S&H for giving Gotham Steel Pans a try, we might recommend exploring these local options before placing your order. Best non-stick pans I have ever used! If you read the review before this one you may have been concerned, but these pans are now ready for consumers. The copper color non-stick surfaces are trendy as well as efficient. I have put them through their paces with my holiday cooking so far and they are a breeze to clean up and seem to cook evenly. I held my breath when making the upside down toasted cheese, but it really did work. I also used a metal spatula and sure enough no scratches. I tend to be skeptical about new products, but after trying the 9 1/2" skillet I was happily made into a believer. Now I have the whole set and gave my old scratched non-sticks the heave-ho! Now I will be buying them for my three daughters on their birthdays this year. Can you tell what website you ordered this from? Fake review. Skip this one as it is from the company that sells the pans. The prose in this review is so good, I suspect it came from a marketing department somewhere. Pro tip to Gotham marketers: make your reviews less coherent and give 4 stars. Sounds like plug from Gotham itself! B.S. company review, poorly disguised. If it is fake why are they still showing the ad? I don't have one and just got here because I saw the ad on TV. Mary has a slightly different alias on other sites, where she posts the same reviews. On another site, she is Mary Ross from Independence, IA. I wouldn't trust any of her reviews as she is clearly working in marketing for Gotham. Very helpful. When I read the last review, it didn't even sound right, like it was a plant, so I'm glad I checked. I'm not going to buy this product. Thanks for the reviews. Excellent product at a fair price. My mother bought me one and I fried two eggs over medium heat and was amazed. I won't be touching the cooking surface with metal regardless of claims that you can. I think this pan will last a lot of years. I'm always skeptical when ordering As Seen On TV products, which always seem too good to be true, and that is why I'm posting this review after just receiving my Gotham Steel Pan. It is exactly as advertised, and is a quality pan. I just threw out my old pan, and will probably order a few more from Gotham. You can have mine for free. I ordered the Gotham Steel Pans through Amazon, and because I have Amazon Prime, I got it in two days. I bought the 12.5 inch for $49.95, with free shipping. I made fajitas with no oil, and they came out wonderfully and didn't stick at all! I've only used once so far, but I really thought it was fantastic. I've read a number of reviews on these frying pans, ranging from 'the best' to 'the worst'! It is almost as if their manufacturer is producing inconsistent quality - with every other pan! All I can say is apparently I lucked out and got one of the good ones. I love this pan and use it every chance I get. That said, it is very lightweight, which my arthritic hands love, but makes me worry that it might not last long. My son used it the other day, and he too fell in love with it and made me order one for him. Hopefully he will get one of the good ones too! I just bought the Gotham Steel 9.5 inch pan today. I read the reviews on this page so I decided to try eggs first. The first egg was fried on a bare pan and it stuck but cleaned up with a paper towel very easily. For the second egg I added a minimal amount of butter. This time it slid all over the pan nicely. I even did the chef flip without a spatula. Absolutely perfect. Normally I do not write reviews. We ordered the one 9-inch pan and my wife fell in love the pan. She was so amazed that she cooked an omelet in the pan with no oil or butter and the egg nor the cheese stuck even a little. She has since tried other ingredients that would normally stick and nothing. Then all you need to do is take a wet rag and wipe out the pan and it is clean. So naturally she had to have the whole set, with Lids. These are for once a product that is worth buying and does as advertised 100%. I love these pans. I bought all 3 sizes and have been using them for about a month. They look brand new and nothing ever sticks. I have tried oven recipes and things just slid out like on the ad. I have made omelette, over easy eggs, grilled chicken, chili, and many other things. I use my skillets every day. I use them with care, no spray and medium to low heat. I have no problems and tell everyone about the pans. Only one problem I have is I got a family of five and I think the pan has to be larger. Other than that, I think it's amazing. I just received the complete set of pans and lids and nothing sticks to them. I've cooked eggs, meat, and cheese. Nothing sticks. I love this pan. I would love to have a complete set of pans, just like the 9 inch pan. Food just slides out, and cooks very nicely.